Brass Rocking Horse Great Gift! Sale ! 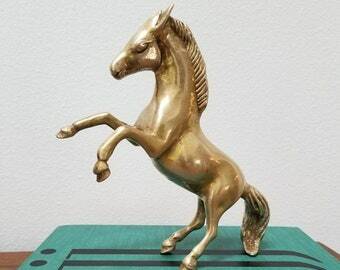 Brass Rearing Horse Great Gift! 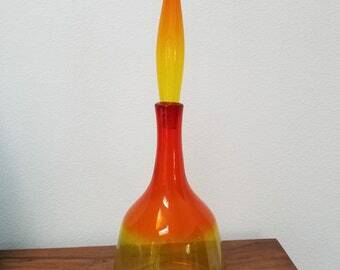 Mad Men Amber Glass CatchallTray / MOD / Repurposed / freeform / Great Gift! Thank you so much. It arrived quickly and in perfect condition. Great experience! Received early, well wrapped and perfect. Thank you! Very pleased with item. Shipped very quickly! Thank you! MidCenturyObsession - sums it all up. After inheriting a gorgeous bedroom suite from my late grandmother, I began to search the net for complimenting pieces. It was that way that I discovered other mid-century modern furnishings and accessories not to mention a whole movement I didn't know existed. I was smitten. Finding mid-century pieces that speak to me has become my passion, my hobby and my obsession. And I blog about it too! I love all things MCM (mid-century modern). I am a fanatic and collector myself, but I also love the thrill of the hunt; especially when I discover unique pieces to share with the world. No returns or exchanges. Please contact us within 7 business days if your item arrives damaged or broken so we can arrange a refund. If an item should break during shipping we require photos of the broken item in the packaging as well as photos of the packing supplies used. This enables us to refund you and receive our insurance claim through the USPS in a timely manner. I estimate shipping cost for each listing. I ship U.S.P.S. standard post when possible. Larger items may be shipped UPS, Fedex Ground or TSC Moving as stated in the listing. Shipping costs will be adjusted for multiple items and any shipping charges exceeding $3.00 for what is stated will be refunded to you back in the same manner in which you paid. Just ask. International buyers, please message me for shipping charges. I will RESERVE your item and get back to you a.s.a.p. with shipping charges. Please note that international buyers are responsible for any and all duties and customs charges that may be incurred. Custom Orders? I can certainly keep an eye out for whatever you're looking for. Most of my items come from estate sales, thrift shops, and my personal collections. Let me know if there's something specific you're looking for. I love the thrill of the hunt! *****Please remember to leave feedback. This shop supplements my family income, so I am always eager to please and do my best to provide excellent finds at excellent prices! Thanks for shopping at MidCenturyObsession.